My friend Kevin Amter, one of the first art directors I ever worked with in this business, is a very successful freelancer. So successful in fact, that he actually wrote a book about it. 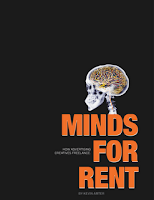 It's called Minds For Rent: How Advertising Creatives Freelance and it's got great tips and much practical advice for a career path that desperately needed a "How To" guide: as smart as many ad creatives are, they sort of lose it when it comes to things like negotiating compensation and schedules and they constantly wind up selling themselves short.